The Ministry of External Affairs is working overtime at a 24/7 situation room to take a flurry of calls and emails from concerned relatives of stranded Indians in Libya. Under Secretary (Bhutan) in the MEA, Priyanka Chauhan, who is the shift in charge of the situation room, said: "We are ensuring that families are not left in a situation where they are wondering what's happening to their loved ones." "We are providing facilitation and interface with our embassy there in Libya, which is already flooded with calls and many people in India with relatives in Libya may not be able to contact the embassy directly or their loved ones. We are providing a place where they can call up, they can speak to us. We take down the details of their relatives and pass them on to the embassy," she added. The embassy of India in Tripoli has set up a round the clock control room which can be contacted for further information or assistance. The contact numbers are: +218 213 409 288, + 218 213 409 289, + 218 213 409 284. Round the clock situation room set up by MEA has been constantly taking calls, emails and faxes of the concerned relatives and have already received more than 600 queries in the last two days. "The embassy in Libya is also facilitating, I believe there are pockets of Indians 8 to 10 people or going up to 1000, representative of each pocket is in touch with us. If there is no contact with an individual, there is contact with a representative," said Chauhan. A young IFS officer, who is on probation in MEA, is performing a 12-hour shift at the situation room. Meanwhile, the MEA has stated that "no payment will be levied by the government for the evacuation of Indian nationals from Libya"
An MEA statement said that the ministry had noticed that some unscrupulous elements are asking for payments or fee for arranging evacuation through the Indian Embassy in Libya. "These activities are completely illegal and individuals engaged in them should be immediately reported to the law enforcement authorities", the statement added. "We are basically getting lot of phone calls from relatives of Indians living in Libya and they have been asking us what is the situation there, what is the progress on evacuation front," said Shikha, an MEA employee. "A lot of them have been able to get in touch with their relatives so they are in contact with them," she added. 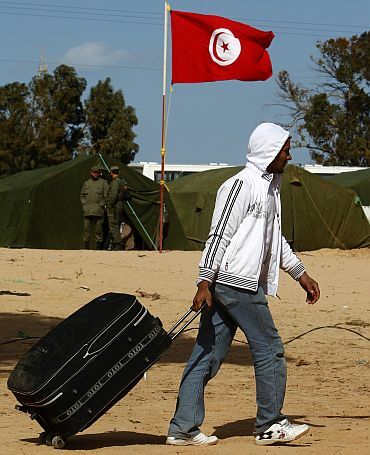 Libya is home to more than 18000 Indians and evacuation of the first batch of Indians is about to begin shortly. India, which has an experience of large-scale evacuation during the gulf war, is confident to bring its people back home safe, until evacuation gather pace situation room is expected to get busier. The central government had on Thursday decided to immediately commence evacuation of Indians from Libya by sea and air in view of the "sharp and unprecedented deterioration" in the situation in the African nation which is witnessing anti-government protests that have claimed hundreds of lives so far. "Evacuation is being arranged by sea and air. The government has chartered a passenger ferry with capacity to seat 1200 persons for this purpose. The ship, Scotia Prince, had reached Egypt on Thursday and has set course to Benghazi, which will be the initial focus of the evacuation operations," the Ministry of External Affairs said in a statement. Scotia Prince was initially headed for Tuticorin from Greece to be used for the Tuticorin- Colombo ferry service starting next week. Shipping Minister GK Vasan ordered the ship to be diverted to evacuate Indians stranded in Libya. MEA personnel and medical team will be on board to assist the evacuees, the statement said. 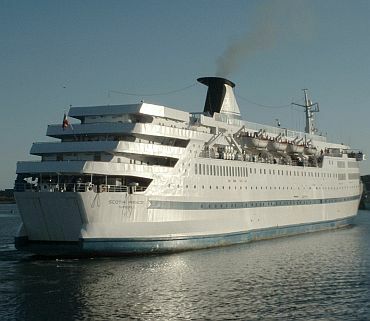 "Scotia Prince is expected to bring back at least 1200 persons to Alexandria (Egypt) by March 1. They would be flown home from Alexandria thereafter, by special Air India flights, which are being arranged," it said. In Tripoli, the focus will be on air evacuation, it said, adding that aircraft are on stand by for this purpose as Libyan landing clearance is awaited and should be received soon. "Preparations are also in hand for evacuation of our nationals from cities in the interior where air access is possible subject to Libyan clearance," the ministry said. 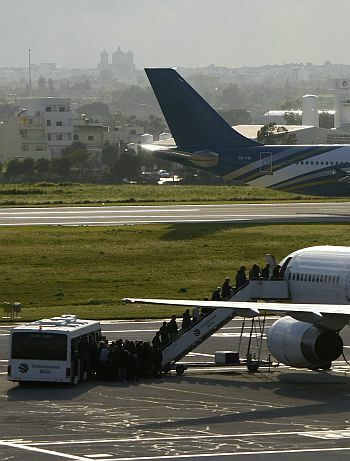 India has urged the Libyan authorities to open up Tripoli airport for its flights so that air evacuation could take place. 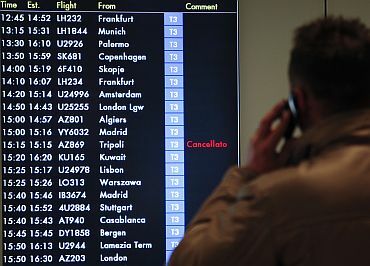 Speaking to ANI, Secretary (East) Lata Reddy said: " We are urging Libyan authorities to make arrangements for our flights to land in Tripoli airport, we have flights on standby here and they can leave once these arrangements are confirmed." "Very large number of foreign nationals are trying to leave Tripoli at the moment, clearances are taking time, our Ambassador is personally seeking these clearances at the earliest possible time and we hope to began air operation at that time," she added. "If need be we are also considering using other points like Malta. We can evacuate by land provided arrangements can be put in place, on the Tunisian side, arrangements are already in place on the Egyptian side for those who are reaching by land, our Ambassador in Egypt is already in touch with them."